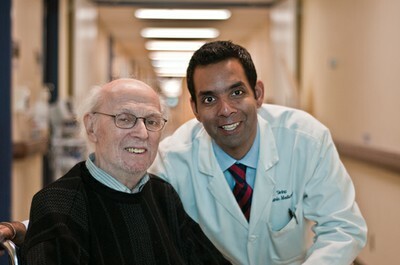 On this weeks GeriPal podcast, we interview Dr. Samir K. Sinha, MD on how he has influenced local and national policy in Canada to redesign the care given to older adults. We talk about the key elements to design an elder friendly hospital and community, including elder friendly design, as well how we can all get involved in influencing policy. Dr. Sinha is the Director of Geriatrics at the Sinai Health System, an Associate Professor of Medicine at the University of Toronto, and Assistant Professor of Medicine Johns Hopkins University School of Medicine. Among his many accomplishments is that he lead Ontario's “seniors care strategy" and is now involved in the development of a National Seniors Strategy. Eric: And Alex, I heard we are going international today. Alex: We are going international today. We are pleased to welcome to the GeriPal Podcast Samir Sinha who's a geriatrician and heads the geriatrics group at the University of Toronto, where he's Associate Professor, and he also has an appointment in Johns Hopkins. He's an innovator and he's done some incredible work. We look forward to talking to you today. Welcome to the GeriPal Podcast! Samir: Thanks for having me, guys. Eric: We usually start off by having our guest ask for a song for Alex to sing. Do have a song for Alex? Samir: Being from Winnipeg in Canada, we're the home of Neil Young and do you have a little “Harvest Moon”? Alex: I love my Neil Young. He is one of my favorite musicians. Just going to play a little bit the chorus right here and we'll do a longer bit at the end. Alex sings “Harvest Moon” by Neil Young. Eric: All right, Samir, we had the luxury of having you over for grand rounds and I also had a chance to Google you after those grand rounds to see some of the things that have been said about you and one thing that came up was from The Toronto Star. It said that this past spring, I think this was a year ago, the Ontario Minister Deb Matthews tapped you to lead the provinces senior care strategy, and the Toronto Star quote was "At only 36, this wunderkind has a daunting responsibility on his shoulders to overhaul the way health care is delivered to Ontario's 1.9 million seniors." That sounds like a very big task. Eric: So, you're no long a wunderkind. Samir: No longer a wunderkind, first of all, and you can't believe everything you read in the papers. But that actually was that was a real neat opportunity. That really reflected a great opportunity to try and think about the things that we know is geriatricians to be important about, not just thinking about what is the illness that's affecting our patient but also thinking about that more holistically, because often we think about our patients having social, functional, and other issues, and we know that it's not just about what we do in terms of prescribing a pill, or prescribing a therapy but it's about looking at the social determinants of health. So, when I got a chance from our Minister of Health at the time, who actually had a PhD in social demography, so was very interested in issues of aging and how that affects our society as a whole, that was a real cool opportunity to say, "What should our blueprint be for Ontario? And really to help influence Canada, being its biggest province." And so we created a report called Living Longer, Living well and it got downloaded, actually, 75,000 times, which is kind of awesome. But it really gave us an opportunity to talk about the need for age friendly communities, to think about how we promote healthy living across a lifespan, and then think about how do we retool our health care system and other aspects to meet the needs of an aging population. So, a huge honor, but a big responsibility. Eric: And you talked about Elder Friendly Design, what is that? Samir: Yeah, so it's one of these things where you think about this concept of age friendly communities. So, the World Health Organization back in the late 2000's came up with idea about saying there are different aspects we need to think about within age friendly community, and it's everything from making sure that we value older people, we think about their needs. But it's also about how we design our public spaces, to actually enable older people to stay active and engaged participants. So, it's little things like reminding ourselves that as we age there's many good things that happen as we age. We're probably smarter and wiser, but we may have more problems with our vision and hearing, and so because of that ... And our mobility might be more impaired. So, how do we make sure that our communities stay accessible and everything right down to the buildings that older people might encounter, like our hospitals. So, how do you start thinking about age friendly design that enables people to still move around their communities, and move through buildings, and actually not have buildings, and even our communities, be harmful. So, I can give you some examples if you like. Eric: Yeah are you suggesting are hospitals and dyads may not be very friendly to older adults? That's shocking. Well that's the majority of folks they see. Samir: Exactly, well so, think about this, right? So, if you think about older people in general, not every older person. We got older people who are marathon runners extraordinaire, but the average older person might have some functional decline. So, getting across that street intersection as quick as we might do and where younger might take an older person a bit longer, and so to encourage people to safely cross the street like New York City, Toronto has now actually lengthen the street walking times. We've made sure that the lettering on street signs when people are driving are a little bit bigger so people can actually clearly see where they're turning. So, it's some of those little things that you don't think about, and we put 1000 new park benches around the city, specifically, in areas where older people might gather because, again, if you get a bit more tired you want to rest your legs, but you want to be sitting on a park bench with arms that allow you to get up and out of that chair as well. Now, think about in a hospital. Hospitals were designed, on average, 50 years ago, most of them, when the average Canadian was 27 years of age. So, when we're young, we can run around places and it doesn't matter how they're designed, we'll figure it out. We can climb over barriers and do our things. But for older people, we know that bed rest for example, every day that you're lying in bed, for example, you lose percentage points on your bone and muscle mass, and bed rest can actually be terrible. There's great researchers in the United States who coined this term "Epidemic of immobility" that occurs in hospitals, and now you imagine that hospitals are noisy places. Hospitals that which promotes delirium. Hospitals can be places where if you're in bed all day long, all of a sudden, and you're not oriented this can precipitate delirium and functional decline. So, little things now in terms of the way we design hospitals can make a huge difference. For example, ways in which you promote mobility by making sure that there are grab bars along the walls so people can actually get up and feel confident walking around. We really recommend that people are not getting breakfast in bed in our hospital. In fact we ban breakfast in bed at out hospital, and we know that just being mobilized up in your chair three times a day, with meals, is a great way to promote mobility. Now, our nurses noted to me that we don't actually have enough chairs to put beside bed sides which is why the nurses are so smart at my hospital. So, what did we do? We bought a chair to be beside every person's bed because that way we have no excuse to not get them up, because we're not serving breakfast in bed, but if we can't get them up in a chair ... So, it's little things like that, or making sure that clocks are actually facing the patients and not the providers. So, that way our patients can stay oriented. So, it's little things like that, but it's also bigger things in terms of when we're redesign buildings. Choosing the paint colors, thinking about those things are so important. Alex: You have paint colors? Samir: Paint colors, absolutely. So, there's actually a really good resource on the Web It's called Code Plus, and if you look at up it actually shows you design strategies that can make a hospital, for example, more elder friendly, and so it's a real cool resource, and it'll remind us that even paint colors can actually ... Especially when an older person might be sitting in a room for a number of days just staring at the wall, unfortunately. Unless there's some nice art, or nice window to help prevent them from becoming delirious and actually stay alert. So, paint colors can actually be important. So, thinking about colors that are more cheery and not dreary, and so when we actually designed our ACE unit, we actually had a paint off where we actually got a few different shades of yellow and we put them up on the wall and the nurses voted on the color they thought would actually be the most elder friendly, and you think it's like ... paint is paint. It all costs the same, right? But if you choose black for your walls that would be pretty scary and depressing. But for the same price you can choose a cheery yellow that puts everybody, especially the grumpy geriatricians in a good mood. Eric: So, have you ever heard of the concept of "unpleasant design"? Eric: There's another podcast I love listening to 99% invisible, and they had an episode on unpleasant design. So, actually designing things to be unpleasant, you mention park benches with armchairs, there's designing of park benches so people can't do multiple different things whether sleep on it, or skateboard on it. So, they design these things so they're unpleasant and people don't want to hang out in them. For instance, I worry for, again, my cynical part is, how much of the design that we see in the hospital is so people don't get very comfortable in the hospital? Or are there unpleasant design concepts that you see that may have more ulterior motive? Samir: Yeah I don't think hospitals, necessarily, would actually design themselves unpleasant because you think that some hospitals don't want a length of stay ... they want people staying longer than they want to be there for financial purposes, and everything in efficiency. But, again, hospitals, by and large, are trying to attract people to come to them. They want to provide care, and I think let's be nice and think that our CEOs and our colleagues really want to make these places appearing friendly. But I think ... Here's the magic of geriatrics and elder friendly thinking and design is realizing that maybe some of the things that we have been doing are actually not informed by the best evidence in practice, and actually, become unpleasant by their nature. So, an example we talked about before this was our hospital wanted to have new flooring in their brand new lobby, and so the designers were really pumped on having black shiny floors, and our head of rehab freaked out, appropriately. Because you think about, okay, well who are the people in our hospital? Tend to be older and frail. Tend to be walking with shoes that have black soles, and so the question is when did the black soles and the floor begin, and so if you have cataracts or glaucoma and you're navigating that black shiny floor with a lot of glare. You can imagine it is a fall risk waiting to happen. So, that's your unpleasant design right then and there, classic example. So, we actually advocated, involved me meeting with the design team, and actually going crazy, in terms of I actually took my shoe off and put it on the tile, on the table. When have you been in a room where a geriatrician has taken their shoe off and put it on the table? We've got to do more of this, guys! But, the point is by showing that they're like, "Oh my god that is so unpleasant and that will be lawsuits galore." And so, this is where we decided to choose a nice, matte finished gray tile that still is an aesthetically pleasing but will not lead to increased hip fractures in our organization. Samir: But they haven't taught us this. Did you learn about contrast and colors in medical school? Samir: And people would think this is really fluffy stuff but this is actually super important stuff. Eric: So, how did you learn about this? Samir: You know what part of it was? Googling on the Web. You start hanging out with like-minded people and hanging out with designers who started talking about these concepts of age friendly design and you start realizing that, wow, if we're going to think about age friendly societies, back to that whole issue, there's a lot to learn when we start thinking about our roles, and our roles where, collectively, we're geriatricians and palliative care providers. But sometimes we forget that we wield a lot of power and influence at times when the hospital has a design committee. They want to physician, or whoever, to sit on it, and again, there are a lot of designers there who don't know what we see and how we think, or who are patients are, and so they're designing things to be pretty, and in their view, practical. But if they don't have that knowledge that we have, and if we don't educate ourselves then we can't actually be more effective as leaders. Whether it be thinking about the care we provide, the design of the environments we work in, or even how our societies actually work to better meet the needs of an aging society. Alex: That sounds like it's more than just physical design. Samir: Absolutely. So, you think about ... There's this concept of the elder friendly hospitals. So, I'm a big fan of this because it's a nice framework to think about, not just the design, which is a part of it. But we have lots of people who come to see our hospital and the work we're doing in geriatrics, and they want to go see these physical spaces. They want to see the shade of yellow on that wall, and I tell them "Honestly, it looks like any other ward in any other hospital. the secret sauce is the staff, and the attitudes, and the knowledge." So, every person who works at our organization at Mount Sinai Hospital in Toronto they actually ... the secretaries, the folks who work in finance, the folks who work at our coffee shop-they all do age sensitivity training, so that they know that we value older people and we know that older people sometimes need a different approach. So, it's changing our culture, which is one of those elements. Physical design is another aspect but not the most important, but an important one. But then it's also thinking about our policies and the way we design our care processes to think about, "Are we anticipating those older adults who are at high risk?" Are we thinking about how to cause less harm, or no harm whenever possible, and how to make sure that we can focus on the most important thing for older patients is trying to get them back home, whenever possible. Alex: So, that must include a lot of thinking about what happens out of the hospital. Samir: Absolutely, so, and again this is the whole issue is that sometimes, by the nature of the work, we're all busy people. So, people who work in hospitals are really good about doing work in hospitals. But one of our concepts is, as a hospital we're not an island. We work as part of a broader health system, and our patients, they don't magically just appear in the emergency department like a video game. They actually come from a place called the community, where they're not living in beds all day long. They actually have families, and they have aspirations to stay independent in the community. So, this is why it's really important to understand who they were and my mentor from Hopkins, Randy Barker, used to always say to me, "Who's at home?" Right? He said that's the first thing you want to know. So, whenever anybody reviews a patient with me I want ... obviously one of the basics ... we have a 93 year old lady from ... where's she from, and who's her family? However she defines that, because all of a sudden it tells you everything you need to know. Here's a lady in living independently at a home with her cat, right? And she's here because she's got this issue. So, and I know immediately if she's got a cat, she's freaked out about her cat. She doesn't care about her pneumonia, she wants to know who's feeding the cat and if we don't acknowledge that then we're not actually helping her to relax and feel that she's in a place of healing and comfort. So, our social worker's all over the cat issue, immediately, and then we can help her out. But then how do we make sure we're not going to have her go delirious? How do we make sure that we realize what was her baseline before? Where is she at now? And if she goes home let's make sure that we have the right home care in place. Let's make sure that we have the right supports and the follow up, so that we can get her out of the hospital as soon as possible. Get her back to her a cat as soon as she needs to be there, because that will help her heal better than being alone with us, frankly. Cats are just so much more nice to be with than say a geriatrician. Just being honest. But we're nice people, but we're not fuzzy like cats, not yet. Maybe if I don't have a haircut. But the point is you want to think about the community, and so we've thought about models like getting our paramedics engaged, doing more home based primary care, more home based palliative care, and other supports that keep people out of hospital but also help people get out of the hospital and stay independent in their communities. Alex: Yesterday in your terrific Grand Rounds presentation, you put up a slide and I'm just going to read a few of the numbers from the slide. "We have choices and options. one day in the hospital costs $1,000." Probably Canadian. "One day in long term care costs $160. One day of supportive housing, or home and community care, costs $55." So, could you talk a little bit about those differences in costs and how you're hoping to change the landscape of home based services in Ontario? Samir: Yeah, so it's an argument that you see is getting played out around the world. so, those dollars really show you a paradigm where we often don't think about numbers in our society. We just know we spend a lot of money on health care, and when you think about older adults ... So, in Canada our stats are 16% of our society are older adults but they actually represent 60% of our hospital bed days, and when you think about how expensive, as you just read at the numbers, hospital days are, that's a lot of money being spent to care for older people in hospitals. Now, we're not saying that we should not care for older people in hospitals. But if we actually think that, in Canada, if we don't have the right mix of home and community care services and other supports, then people actually just kind of hang out in the hospitals until we get our acts together and get those services in place. So, imagine now ... and we actually have 15% of people in Canadian hospital beds who are waiting to go home, or going to a rehab center, or to a nursing home because we don't have the right mix of services in place and there's lots of other inefficiencies in every other health system as well. So, that costs us billions of billions of dollars. But if I actually just had more home care in place I could actually get people out of hospital sooner, and so that was my pitch to the politicians because a lot of people ... again, politicians, they want to get reelected. That's their number one goal, right? If you think it's anything else it's not, right? So, they want to get reelected, and I think, by and large, smart politicians also want to do the right thing, which is helps them get elected. So, the ... but I think the key is, when they start thinking about things people who don't have the knowledge and skills that we do, or the full understanding, would say, "Wow, we've got lots of older people living in hospitals, or need long term care nursing homes. Maybe just send to a nursing home." But, okay, I'll do a little poll in the room. How many of you ... well, of you two, so I've got two people in front of me, and our live studio audience, so okay. How many of you aspire to end up in a nursing home? Nobody. I've asked that question to thousands of people now in all the talks I've given. Nobody ever raises their hand. So, the key is people want to stay at home and you just read out the numbers. It's far cheaper to care for people in their home and there's great evidence for home based palliative care, home based primary care. It's cheaper, it's more cost effective, it's actually in line with what people want. So, if you're a politician who wants to get reelected, as our government did to, they actually came out and said "We're going to build no new nursing home beds, we're actually going to give more people more home care." And you know what? They want to majority government. So, politicians out there who are listening and there's probably lots listening to the wisdom of this blog. Honestly, if you talk about helping people stay at home, you resonate with what the people want, and ironically, or not ironically, logically it's actually the cheapest option. So, this is where our government actually froze hospital budgets for five years in a row, and they invested ... They've increased home and community care budgets in our province by 5% as part of the work that I had done, and by doing that we actually have seen less demand for nursing home beds now. We've actually seen the placement of older adults into nursing homes is decreased by 27% mainly because we actually have more home and community care available. So, it's kind of an interesting opportunity where, again, geriatricians who know what their patients want, which is nobody wants to go to live in a nursing home if they can resist that. So, it's actually when we show the politicians that what the people want is actually what the least costly option is. All of a sudden, we have an opportunity to actually do the right thing, and actually save our system dollars as well. Alex: So, we have a challenge to that from one of our listeners. So, I tweeted out the image of the slide yesterday and David Grabowski, who a professor of health care policy at Harvard Medical School, responded with a question. He said, "Home care based services, lower cost per day, but research suggests home care based services are higher in cost to the system, system wide, due to increased use. In other words, if you build it, people will use it." The key question here, "Are home care based services more cost effective?" I think he's saying system wide here. Samir: No, it's an excellent question, and I think, here's a few ways to look at it. So, when you actually look to Europe. So, when Europe was actually building in systems that had more integrated home and primary care, much more robust than what we do in Canada and the US. So, one of the challenges they had was there was actually this policy thinking in the 50's called floodgates mentality. That if you actually provide more home care then society would stop looking after their families and friends because they would just leave it to the state, right? And so, a lot of political conservatives say, "We should not be a welfare state because if we do this for people they'll stop doing their familial duties." Okay, so actually none of that is ever held true because that's basically saying that you are no longer going to want to take care of mom, or your brother, or sister, or whatever. In fact, the data, and I can only really speak to the Canadian data, but we know that 98% of home care, government funded home care recipients, have a caregiver involved in their care, and when you actually look at all the home care that people living at home receive, 70% of it is actually provided by unpaid family members and friends and only 30% of it actually ends up being what the government puts in. So, you can imagine here that there are a lot of family ... So, people don't abandon their loved ones, number one, and that's why home care is such a cheap effective option. Now, if you got rid of all the families and friends and then we just had to provide all I care it becomes very expensive. But in reality it isn't. Now, the other aspect that when I've talk to government policymakers because we've really expanded home based primary care in Ontario. Canada, it's the only province in Canada where we're actually seeing an increase in the house call, again, the rebirth. Mainly it's because we've made some economic maneuvers to do that. But the arguments there are the people say, "Well someone doing home based primary care. They're only seeing eight patients a day." And they say, "Well, shouldn't we just create buses where we just bring all these people to the clinic?" Because in a clinic you can see 50 patients a day. But here's the thing. Patients who require house calls ... So, we have a great house calls program that we partner with in Toronto and we use the tagline the House Calls for ... It's an advertisement but just amongst ourselves as clinicians we say "We provide House calls for people for whom it's a necessity and not a convenience." If you're home bound you probably have a lot going on. You're probably quite medically complex and at very very high risk for going to the emergency department and living in a hospital at a $1,000 a day. So, these are the types of patients we're talking about who are the most costliest to care for in the system. But there's great evidence and anybody in ... And our colleague at Harvard could look at the evidence coming out through the independence at home demonstration project in United States that centers for Medicare innovation have been funding. Because that's actually significant shown that home based primary care models which absolutely are very intensive models of primary care. But when you ... And of course, if you did that for a person who didn't need home visits that's a really expensive intervention for a person who didn't need it. But when you match that level of intervention for that level of need you actually find that that saves a significant amount of money because it's avoiding hospitalizations and ED visits and that's where the cost effectiveness of the model. So, I'm not advocating home care and intensive home care models for everybody but it needs to be targeted and the evidence is showing us very clear. Especially, when you look at models like hospital, home, and other aspects that actually you can do this care cheaper. People are likely to die less. They're actually able to get better health and system outcomes, and so it's interesting because there's still a lot of people think that this is all boutiquey, and it's kind of fluffy. But it's actually the smart thing to do and a lot of leading models in the UK or in Europe, in particular, home visits are just a standard part of local primary care practices. But it's still not as common as you'd think in North America, and we've got to change that. Eric: I'm incredibly impressive, what you've done, including at the local level, creating acute care for elderly strategy. At you hospital in the community. At a regional level, thinking about what you're doing in Ontario, around the senior strategy and now nationally, you're involved as well as creating a senior strategy is that right? Eric: Can you tell us a little about that? Samir: Yeah I think, again, I was very lucky in Ontario that I had a Minister of Health who had a PhD in social demography who said, "Hey, can you give us some advice?" And, "Hey, we might even follow it too." Which is kind of cool. But you also start learning that, just like both of you have realized, you're not going to wait for someone to tell you to wait to share your ideas. Sometimes when you have good ideas, you need to broadcast that out there and start a movement yourself, and so with our national senior strategy ... It's actually kind of fun because we actually had a federal election coming up and some you'll know that our ultra-cool new prime minister is Justin Trudeau. But again ... Yeah, no, we saw an opportunity there to say, "Fresh new government, potentially going to be elected. But how do we make older people part of that agenda?" Right? And so, we could have waited for someone there to come and ask us and we were just tired of waiting. We just said we have good stuff to share and actually our National Institutes of Health Research, our Canadian Institute of Health Research, they gave me a grant and said "Lots of people talking about seniors. Good, good for you. But they don't know what they're talking about. So, could you actually create evidence informed national senior strategy?" So, get this, I got research dollars to actually do something really fun and I was actually looking at the issue of co-pays, and looking at pensions ,and looking at housing, and all these different things. So, we actually created a website, because that was part of the grant. You can go to www.nationalseniorsstrategy.ca and you'll find ... You can follow us on Twitter as well @NSS, for national senior strategy underscore now. So, @NSS_now, and you can follow like what we're up to. But basically by actually talking about the importance of what our federal government could do through supporting people to stay independent and productive. Helping to promote healthy and active lives, making sure that we can provide more care closer to home, and also doing things like supporting caregivers, especially when one in three in Canada are actually balancing work and unpaid caregiving duties. All of a sudden, we could show the federal government - that was our goal in this strategy to show the federal government what they actually held the levers towards and could do, and the cool thing is that Justin and friends, our new minister of health who's a family physician and a great collaborator of mine from her previous life. Our new Minister of Finance, and our new Minister of Families and Social Development who actually is an economist from one of the universities. They are super smart people and they actually have read our report, and they have now changed our pension program in Canada to make sure that people are not aging in poverty. They've already established a new caregiver credit to help make sure that people who are caregiving don't end up in poverty. They've also committed six billion dollars for expanding home and community care services across the country. So, it's not too bad what you can do, even when you're not asked to do it. So, my advice there is, we can create a movement and it starts with us. Eric: Well, talking about creating a movement, it is really impressive what you have done and your ability to advocate for care of older adults, and we need a lot more of that, especially in the US. Alex: We also have a new government, and a new president. Alex: Have you heard of this guy? Alex: Donald somebody or other. Eric: What are three things that listeners on this podcast can do to get involved with policy and advocacy that you've learned may be effective? Samir: Okay, I think the key is, A, some people think that, "Well, maybe that's somebody else's job." and you know what? It's everybody's job, number one. So, my advice is ... the way I started is we're all part of a community, and it could be a big community, it could be a small community, but get to know your community, and get to know your neighbors. Because you often start finding out that ... I was worried about older adults falling at home and then I realized that our chief a paramedic services in Toronto was worried about older people falling at home as well, and he told me that and I said, "Well, do you want to work together?" He said, "Oh, we would love to work together with you because if we can prevent people from falling at home then there's less 9-1-1 calls." It makes their lives easier and they're not seeing people suffer as well. So, we immediately came together and we created a community paramedicine program, and that's an example where, who's in your neighborhood and it doesn't have to be as crazy as a need as that. But it could just be a matter of if you're a physician working in the local community, get to know the local social services agencies and sometimes they'll say to you, "Oh goodness, we're dealing with the same patients, so maybe we could just give a half an hour of each other's time a week and we could actually case conference a bit." And that'll save each other time. So, it's, A, getting to know the people in your neighborhood, B, figure out what the issues are and what role you can play either to facilitate, to educate, to support. Because sometimes you're not going to be the leader but you can be the best supporting actor, right? And the question is when is it important for you to lead? When is it to follow, right? So, when my head of rehab said I need to get up to a meeting, canceled everything I was doing, and put my shoe on the tile I always say, "Tell me where the hoop is and I'll jump through it. Tell me where to stand, when to bark, and how loud to bark, and what to bark about." So, because I realize I have a level of influence. We all have a level of influence, and know when to use it, and be prepared to use it that way. Alex: And then one more. Samir: And I think the last thing is, I don't know if it's copying the same other thing but it's about educating yourself on the issues. Stay abreast of the issues, and stay on top of what the political winds of change are. Eric: Like listening to podcasts? Samir: Listening to podcasts and it's paying attention because you know what? You may have a great idea, but it may not be the right time, and my whole thing was, I had political conservatives and people thinking about money and health care. And then I have more kind of liberal minded people who are saying, "Give the people what they want." And so, I think my greatest accomplishment in working on the Ontario strategy was getting all three political parties, who had very different views, to actually come together and all argue about the importance of home care. And from the conservative standpoint it was all about dollars and cents, and from the bleeding heart liberal standpoint it was all about this is just the right thing to do, and you know what? In the end, everybody saw ... Came to the same conclusion but they came to the same conclusion from different paths, and doesn't ... I don't really care in the end. Frankly, my patients are getting more home care and that's what matters. So, but it's also knowing when to strike. So, pay attention, listen to this podcast because you will have endless sources of wisdom, and then know when to strike. Eric: Great. Well, I want to thank you for joining us on the podcast. Eric: Alex do you want to sing us a song? Alex: All right. I just want to ... So, you grew up in Winnipeg and Neil Young is the local folk hero there? Samir: One of our local folk heroes. We are actually a hotbed of cultural talent. Samir: There's the Guess Who as well, and some newer folks like Shontelle Kreviazuk, and other things. So, just, yeah, little hotbed of talent. Alex: I'll have to check it out, and your history teacher wrote the biography? Samir: Exactly. John Anderson, he actually wrote the autobiography of Neil Young. Alex: That's great. This was your history teacher in high school? Alex: Yeah, so a little bit more “Harvest Moon” here, from the top. Great and informative podcast. Can you please post links to websites mentioned?